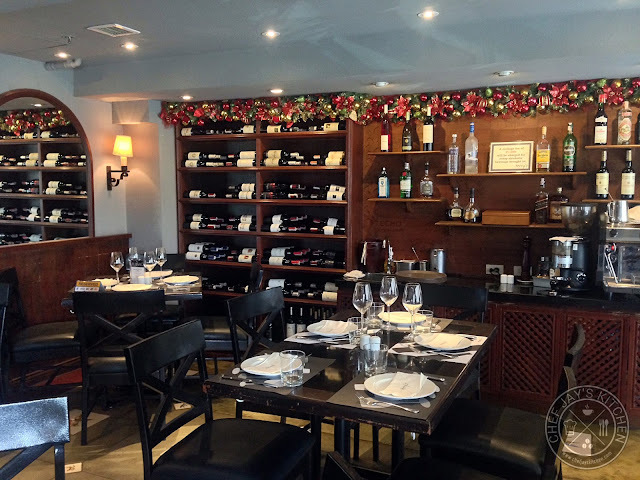 Terry's Bistro is an unpretentious Spanish restaurant known for their splendid Spanish inspired dishes, great selection of wine, and amazing hams and cheeses. 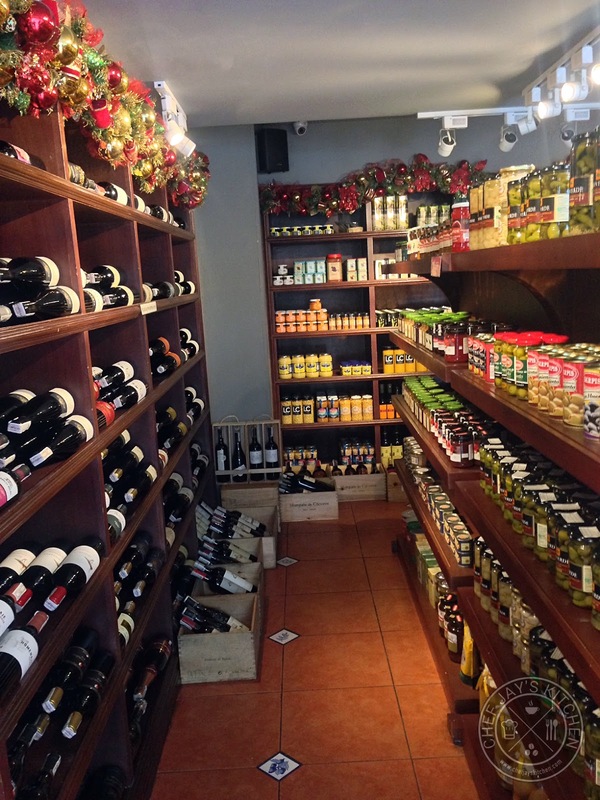 They also have a grocery, Terry's Selection, that offers a wide selection of gourmet ingredients so that you can whip up your favorite European dishes at home. Chef and owner, Juan Carlos "JC" de Terry, started Terry's Bistro as a means to share his passion for food he loves - authentic, unpretentious Spanish cuisine, meticulously prepared the traditional way, that he grew up with. He also loves Filipino cuisine, so he does have a number of dishes on the menu that's a delicate fusion of Filipino and Spanish food. We had the opportunity to try a number of specials from their menu and here are the dishes that I recommend you try. Terry's Bistro is a fine dining restaurant with cabinets of quality wine, elegant tables and chairs, and fancy tableware. 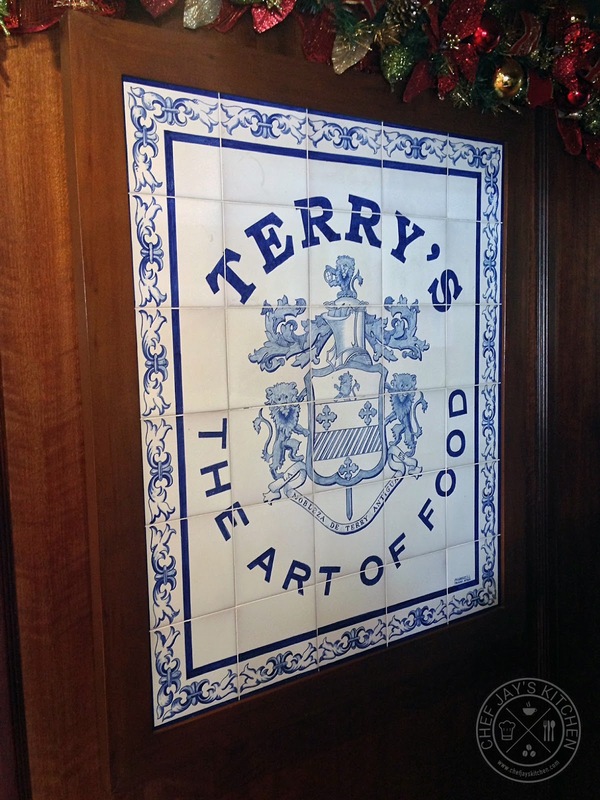 All of these elements help make Terry's an intimate place to dine in, especially if you would like to impress. Terry's Selection at the first floor is a gourmet grocery that offers a number of ingredients you would normally find in European cooking. They also have a great selection of imported wine that you can bring home. We were enjoying their complementary bread while waiting for our food to arrive. 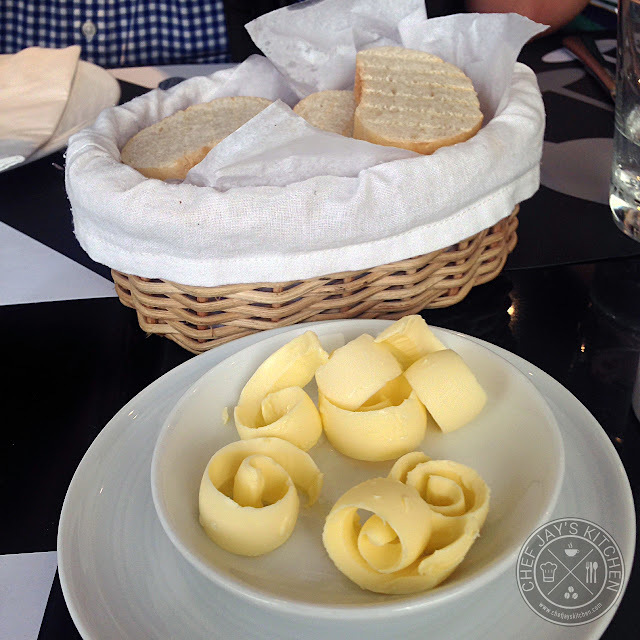 The bread was really soft and tasty, just delicious when slathered with a bit of butter. The Fresh Oysters Sharing the True Flavors of Galician Escabeche (Php 390) is a wonderful way to start off your meal. 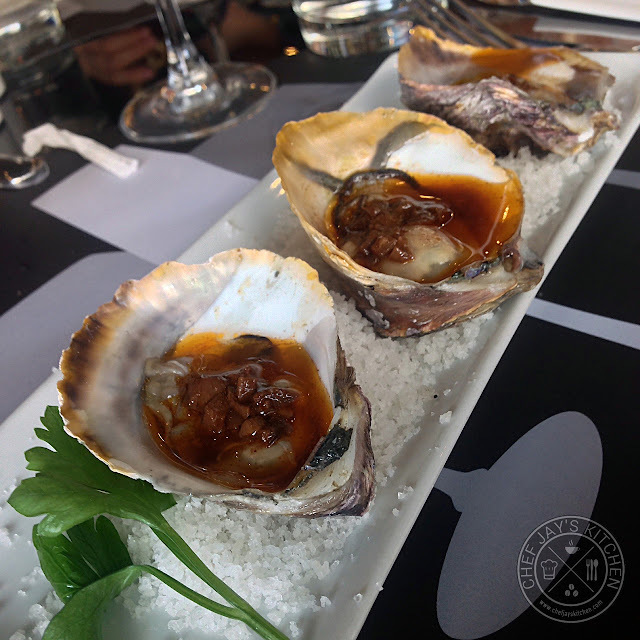 The Galician fresh garlic, organic spices, and Sherry vinegar marinade gives the already taste fresh oysters a beautiful sweetness and acidity. I loved sprinkling just a bit of salt to on the oysters to really bring out the wonderful flavors of the dish. 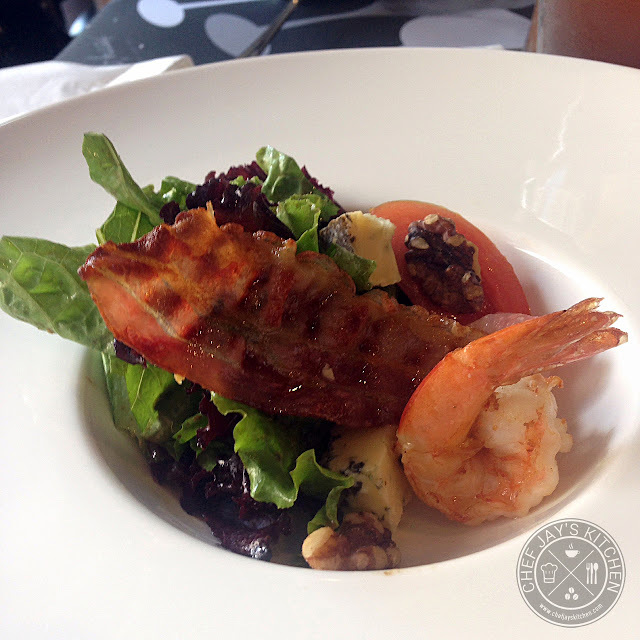 The Kings Ransom Stilton Salad (Php 300) is a salad of organic greens and nuts with grilled shrimps, Stilton cheese, Rioja smoked pancetta, and pomelo topped with a Stilton-Balsamic Vinaigrette. If you're looking for a fresh and healthy appetizer, grab an order of this delicious salad. The Stilton cheese and the vinaigrette really helps bring the dish together to make this into a really tasty salad! The Croquettas de Cocido (Php 320) is filled with Terry's Cocido meats and layered with their tasty bechamel sauce. 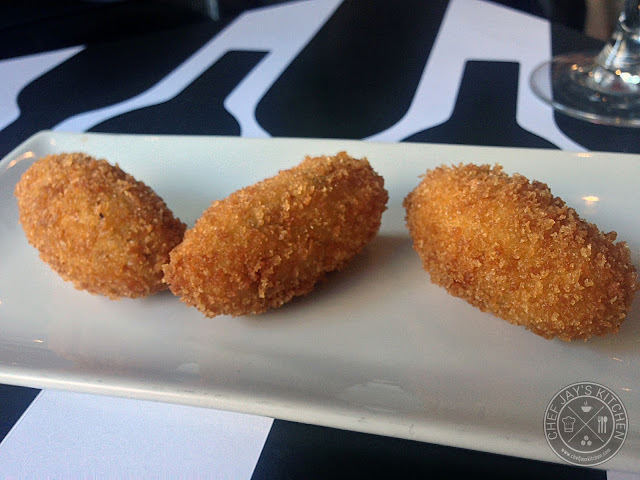 I loved the crispy exterior of each croquette and the potato was really silky smooth. Each bite was rich, creamy, and delicious! The Seafood Curry Symphony (Php 520) is a delicious harmony of scallops, shrimps, squid rings, and clams served with basmati rice. I have to declare that this is my favorite Terry's Bistro dish! I have to admit, though, that it tasted more like a seafood stew than a curry. 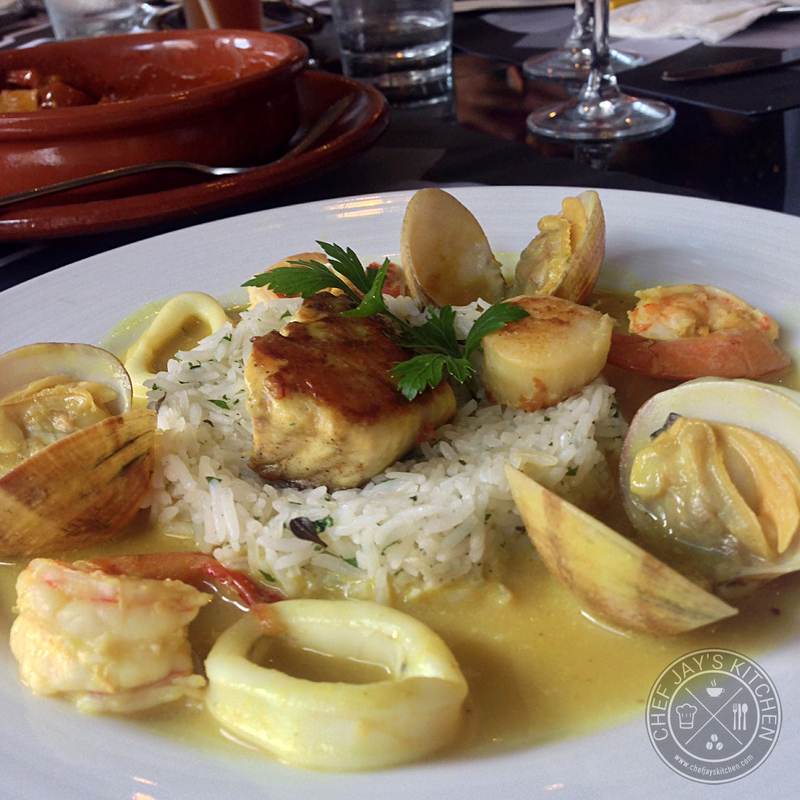 It had the flavors of the sea - fresh and vibrant with the flavors of the seafood beautifully coming together. This is definitely a must-order dish! The Dinuguan Risotto (Php 520) is a Filipino-Spanish fusion dish made of pork meat and black sausage with Basque chili peppers and a sherry vinegar. This clever dish was created by JC Terry for the first Madrid-Fusion Manila in April 2015. 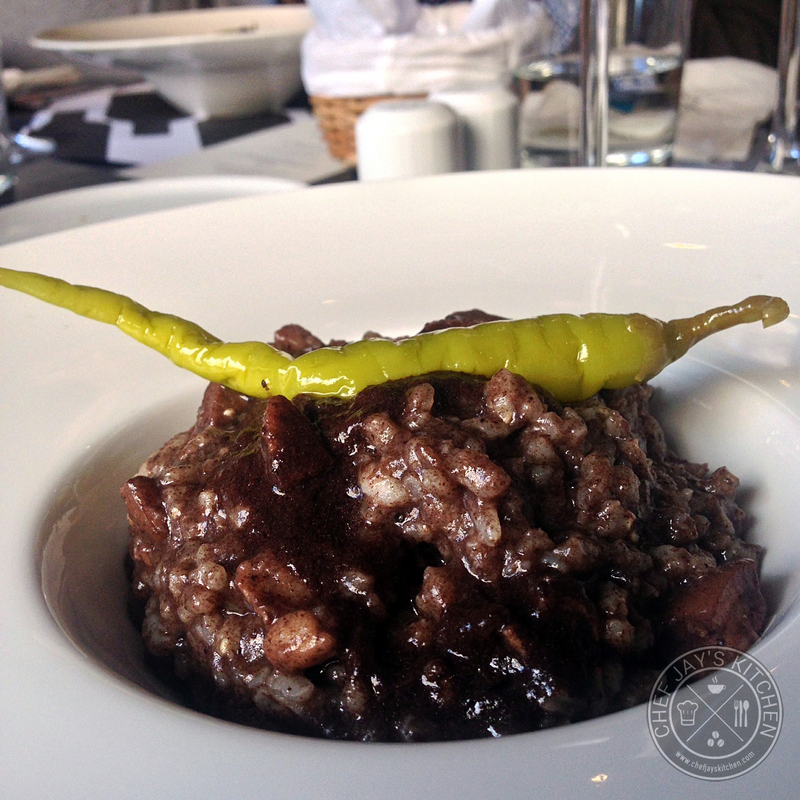 The risotto itself and the dinuguan was cooked and flavored beautifully - salty and savory just like how dinuguan should taste like. Dinuguan is not for everyone, but I do recommend you give this Filipino-inspired favorite a shot! I only wished the dish had some crunch in it, maybe a bit of chicharon would do wonders. 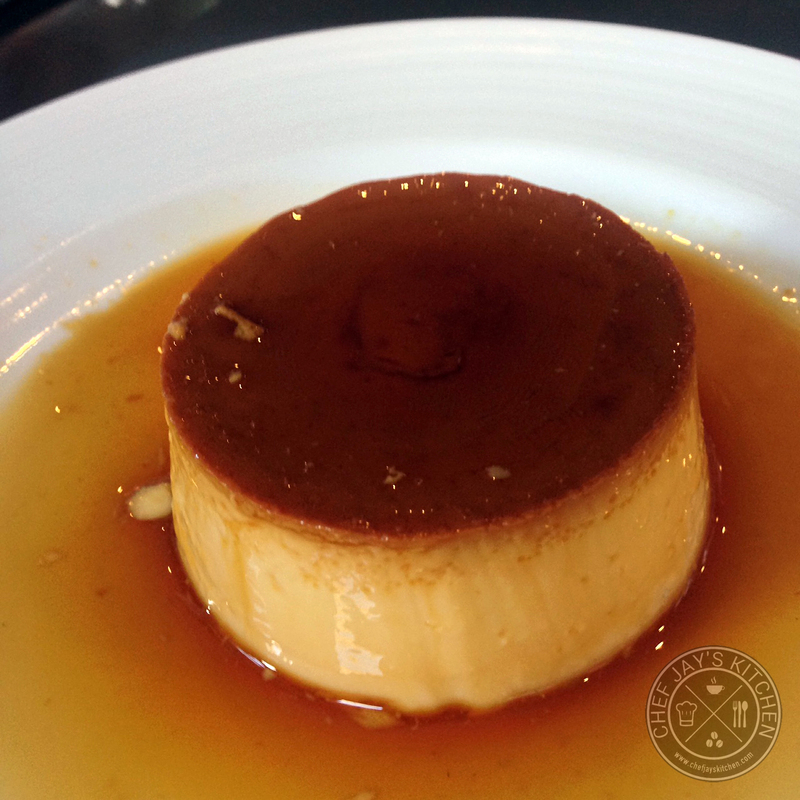 The Flan de la Buela (Php 125) may look simple but it's a surprisingly delightful dessert. The flan was light, creamy and with just the right amount of sweetness. I became a fan from the very first bite, so don't miss this. In case you're wondering, no this isn't just like a classic Filipino leche flan at all. This is one of the best flans I've ever tasted. It is, hand-down, my favorite Terry's dessert! 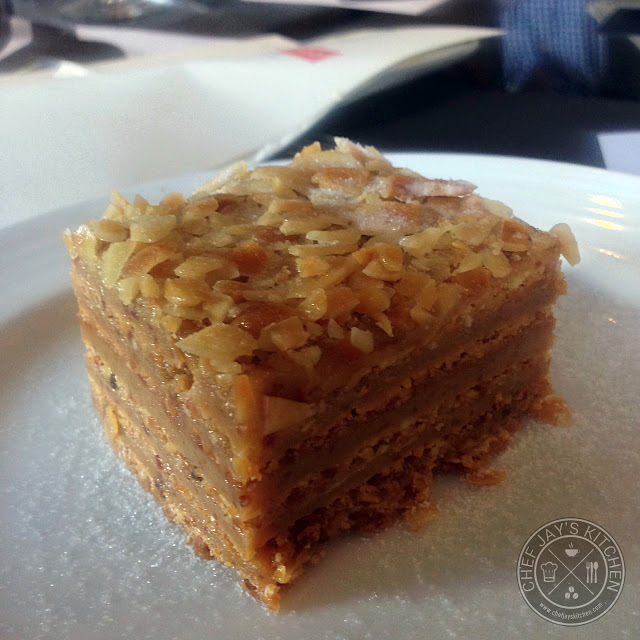 The Tarta Imperial Rusa (Php 210) is an authentic Russian tart that was said to have been served during imperial banquets. It is also where the Sans Rival got its inspiration. The tart had a really good caramel flavor that complimented the almonds quite well. This was the sweetest of the three desserts we sampled - maybe a bit too sweet. 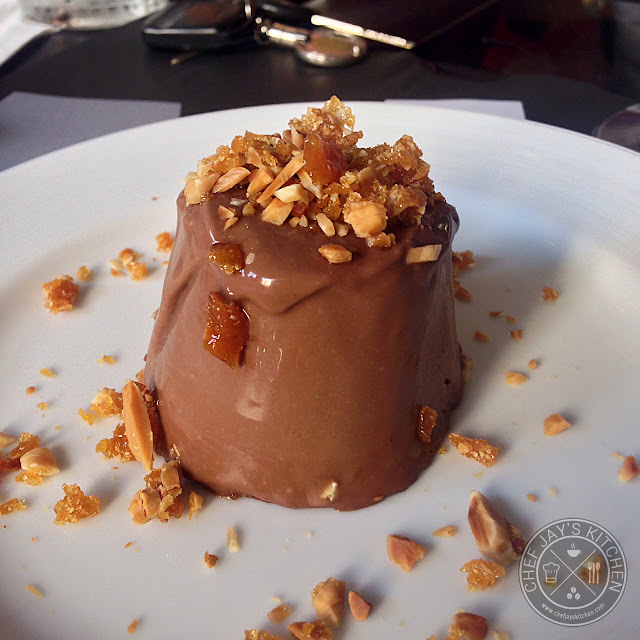 The Marquesa de Chocolate (Php 210) was a delicious chocolate marquise sprinkled with almond praline. If the Flan de la Buela was a light dessert, the Marquesa de Chocolate was decadent, rich and dense. It felt like I was eating a very dense dark chocolate ice cream. The almonds added a nice crunchy texture to the dessert. If you are a sucker for chocolate, you should certainly have this for dessert. It's perfect for sharing. Terry's Bistro stays true to the flavors of Spain but at the same time innovates by offering Filipino-Spanish fusion dishes. I would love to come back to try more of their Spanish dishes or have another hearty serving of their outstanding desserts. Don't miss out on the The Kings Ransom Stilton Salad, The Seafood Curry Symphony, Flan de la Buela, and Marquesa de Chocolate, dishes that I'm sure you'll love. Terry's is a great place to enjoy some delicious food paired with good wine.